If you ask me now what trends were circulating the Fashion industry last year, I wouldn’t be able to recap all of it. Truth be told, I am not catching up on the latest fashion trends by reading magazines or the reviews after a fashion show. However, due to my full time job, I get to sit in front of a big screen, watching the latest trends and runway shows during fashion week season. However, I won’t go desperate if I weren’t to catch up on all these fashion updates in real time. 2015 somehow was a year where I discovered so many trends and saw a variety of great styles, simply by wandering through the streets of my favourite city: Tokyo. Whenever I was looking for new ideas I just had to go out. There is so much to see and explore in Tokyo. You never know but a new source of inspiration might just happen to be around the corner of the streets of colourful Harajuku or during a stroll through Shimokitazawa, a great spot for vintage finds. In this post I want to share with you some of my personal favourite trends and items I wore in 2015; some of them you already saw on my Instagram. I am normally not too keen on big logos (sorry Moschino) especially in high fashion. I somehow discovered a whole new universe in athletic labels that were once long forgotten such as Champion and Fila. All these brands carry big logos with a bold color scheme. I love the vintage Tommy Hilfiger pieces and was super excited when I saw the images of their campaign starring Suki Waterhouse. Another great comeback was by Fila with their capsule collection. I remember exactly how many times I was annoying my sister while we went shopping in Tokyo. Almost every other item was by Fila that I was showing her. I also remember how my friend Nuran had to go with me to the exact same store more than once because I was indecisive whether to get that windbreaker Fila jacket or not. By the time I decided to get it, it was sold out in my size #truestory Since I am a 90’s girl, I love its revival and believe that streetwear and 90’s sportswear are an amazing combo. Another great item that I was constantly wearing was a baseball cap. I remember when I discovered this one great polo cap by Ralph Lauren with my friends (it was the color that got me!). Again I was dragging my friends there several times and again by the time I decided to get it it has already been sold #mykindofluck I enjoy wearing a baseball cap as an alternative to snapback and 5-panel caps. 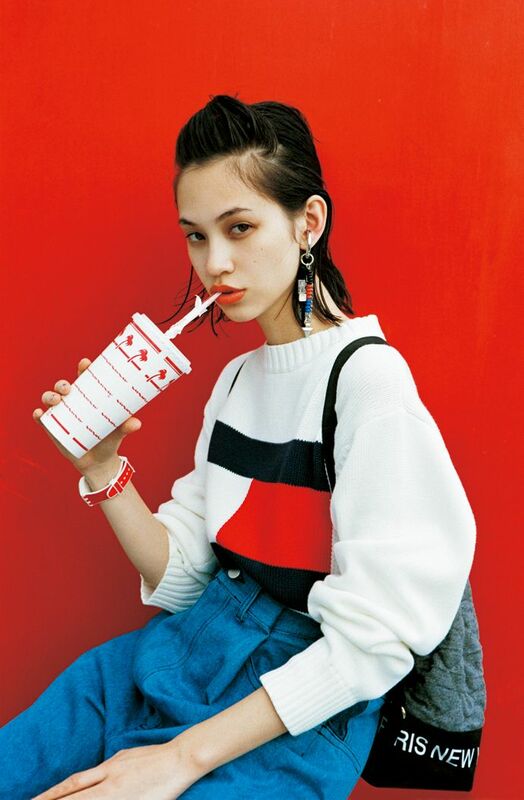 Living in Tokyo as a 90’s girl is ideal. I saw so many great men styled in a full 90’s outfit combo whereas girls were pulling off the choker trend around almost every corner. I am usually big on golden jewellery but sometimes a nice choker goes so much better with streetwear. It’s a fun way to accessorize. If you are following me on Instagram and have read previous posts on Followingmi you know how much I enjoyed wearing my Adidas Stan Smith. White sneakers were big this year, and you saw them everywhere in streetwear and high end fashion. They’re effortless and go well with literally everything. You can find great white sneakers such as Puma, Nike Blazer, Common Projects, Axel Arigato or the classic Adidas Stan Smith, which is now also available in all white. All-black-errthing-black (or all-white) is a timeless combo and will probably always be. I love wearing colours though and pink somehow became an additional color in my wardrobe. Not only my wardrobe, but last month I decided to dye some parts of my hair pink, more like a softer pink blush color. I read somewhere that blue and pink are the colours of 2015 – thanks to Justin Bieber (What Do You Mean?). What are your personal favorite 2015 fashion trends?